Nanotechnology has been used to both improve the products that we use every day as well as to create some art. The technological advances in nanotechnology have made it possible to take this realm of science and use it to benefit others, by making it useful in home items and to create something nice to look at. Dr. Gimzewski speaks about the many wonders that come from this field of study in the lecture videos on the course website. 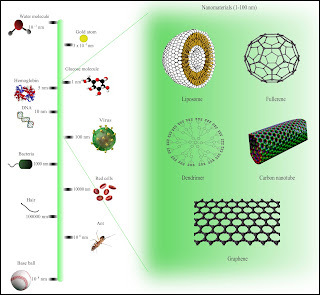 The field of nanotechnology as Victoria Vesna and Jim Gimzewski puts it is that it is “concerned with control of matter at the scale of atoms and molecules,” (Gimzewski and Vesna). The different technologies that have been put to use in this field of science show exactly that. One thing that really struck me was the Scanning Tunneling Microscope; this device can be used to manipulate atoms, which is pretty cool. 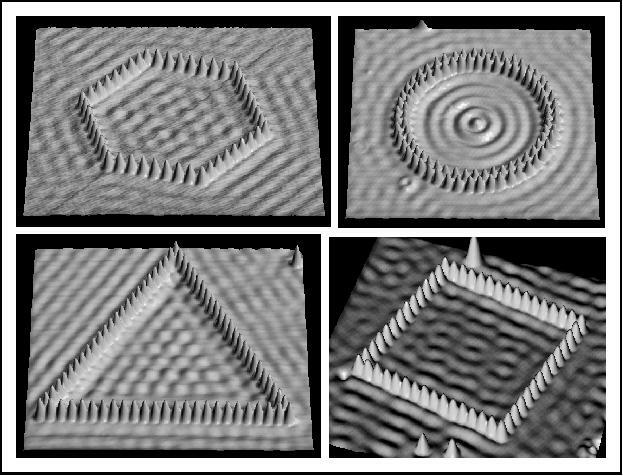 It “shows three-dimensional images of a sample,” (nobelprize.org) which is usually of atoms and their parts. 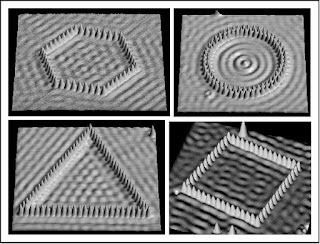 The process of manipulating atoms is called Quantum Corrals; some people have made them into aesthetically pleasing images. However the purpose of this machine is to study the structure of a surface at the level of the atom. "Art in the Age of Nanotechnology." Art.Base. N.p., 11 Mar. 2010. Web. 22 May 2016. <https://art.base.co/event/2104-art-in-the-age-of-nanotechnology>. Gimzewski, Jim, and Victoria Vesna. "The Nanomeme Syndrome: Blurring of Fact & Fiction in the Construction of a New Science." Vv.arts.ucla.edu. N.p., n.d. Web. 22 May 2016. <http://vv.arts.ucla.edu/publications/publications/02-03/JV_nano/JV_nano_artF5VG.htm>. "Past Exhibitions 2010." John Curtin Gallery. N.p., n.d. Web. 22 May 2016. 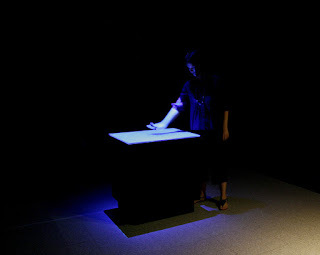 <http://johncurtingallery.curtin.edu.au/exhibitions/archive/2010.cfm>.
" ." STM Image Gallery. N.p., n.d. Web. 22 May 2016. <http://researcher.watson.ibm.com/researcher/view_group_subpage.php?id=4252>. "The Scanning Tunneling Microscope." The Scanning Tunneling Microscope. N.p., n.d. Web. 22 May 2016. <http://www.nobelprize.org/educational/physics/microscopes/scanning/>. Vesna, Victoria. "Unit 8 View." UC Classes. N.p., n.d. Web. 22 May 2016. <https://cole2.uconline.edu/courses/484297/pages/unit-8-view?module_item_id=8599417>. Wikipedia. Wikimedia Foundation, n.d. Web. 22 May 2016. 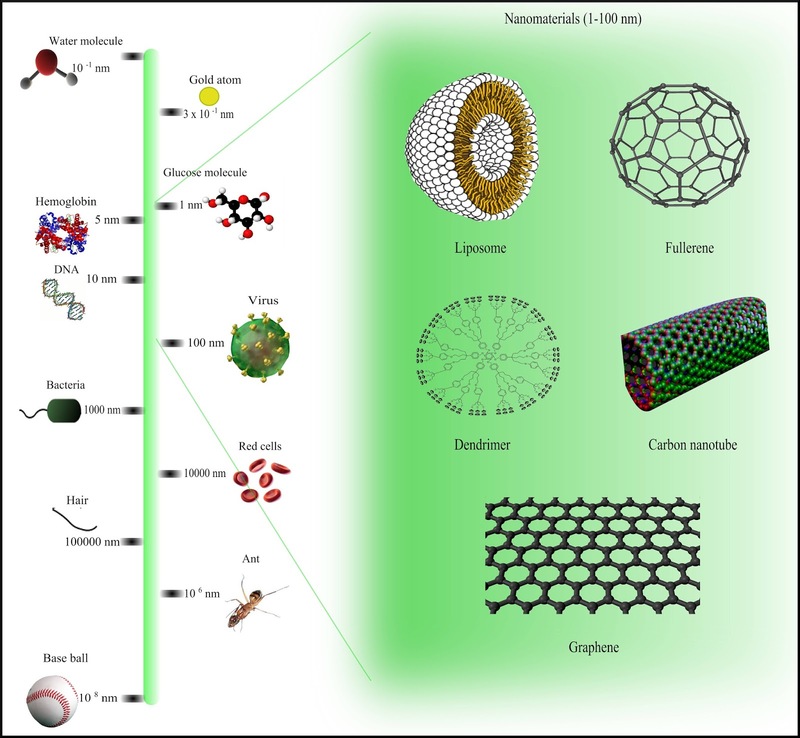 <https://en.wikipedia.org/wiki/Nanotechnology#/media/File:Comparison_of_nanomaterials_sizes.jpg>.